1) Sketching part depends on your practice of shading and perspective as well as line of quality. So, I won't be doing that here ! We may use invisible liquid on the stem of wrist watch, which would give a look of only time part attached to one's wrist; thus giving unique look. You can apply this for frames of spectacles (not on glass) which will give an awesome and funny look. For women, a chained type of two or three linked earrings can be assumed; making the ring (that is in touch with ear) invisible. We can make invisible cages of pets as well as fish aquarium to give magical look. Applying invisible liquid to tube lights will give a decorative look. Quality of the visible plates, utensils and chairs seems unhygienic; for which replacement/maintenance on time basis need to be taken care. Lightening system is dim, thus giving unaesthetic feeling for dining on canteen. Standing place on cashier counter was less making more crowded look; for this the freezer on the right side of the counter could be shifted to left side making more space for people to stand. Display of items that is sold by the canteen is not clear because of small board with unclear rates; for this proper table to table menu card as well as colored marking on the display boards may work (even digital display works well). The serving and packing table on the left is raised higher, thus making problem for easy transaction as well as communication; better it should be lowered. 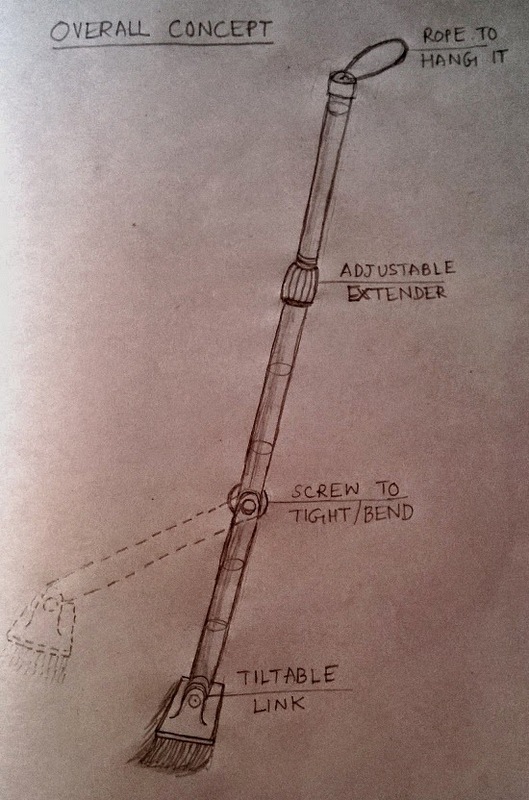 The mop should let the user use the mop without bending most of the times. Number of times an user rubs the ground on a single area should be minimum; in other words it will be better mopping once to clean the most part of the floor. Mop should reach the edges of the room/floor. It should be flexible and adjustable with replaceable brushes. Mop should be able to reach the floor under tables, sofas etc, without letting the user bend much. Like I mentioned in the beginning of this article, you may want to check the links at the end of this section to get an in-depth insight on how to frame and represent designs in CEED exams. That links will also help you on what to be included and what not to be included in designing a product. One tablet before breakfast at 7:00 AM. Well, I didn't draw this seriously because of shortage of time. You are required to make the poster clearly just like we did for the above mop design. I just wrote my story thinking myself as a crow. You can think of your own in a similar way. "Hi, My name is Kalia and I used to live near Qutub minar. When I was small, my father used to call me prince of qutub minar. As I started growing, I met with my best friends named kaka and kari, with whom I wandered around the place making fly races and also get food from what visitors left. We had seen many different kind of people all around world. Whenever I sit at the top of minar, I recap my father's words and feel proud of being called 'king'." Well, the story board framing part of this question will be dealt later. It may be left to you to practice. Remember, you need to write the story in five sentence as asked in the question and I guess I just wrapped the story in two sentence ! 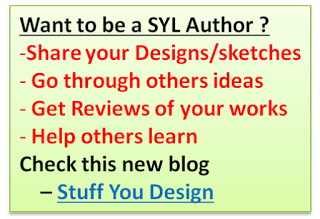 Like Stuff You Look blog on Facebook page to get connected with latest posts. Wow, incredible blog layout! How long have you been running a blog for? you made running a blog look easy. The full look of your site is excellent, let alone the content material! 1)Ceiling fan are not at there correct position. -> It should be above the crowded area so the proper illumination can be spread out using available light facility. 3) The weighing machine placed at the centre of counter. -> It should be at one corner (electric board side) so there will be more place on counter for the costumers. Great to see that you shared your ideas too. It should be helping others and thanks for sharing. I would also expect readers to comment their ideas like Pankaj did for better grouping of ideas. I think there is much use of red color in the canteen , due to this colour the overall environment is quite dull.As it is a college canteen there must be enthusiastic environment the chairs must be made of wood or steel etc and must have joyous colours. Yes, you need to draw brief sketches for second question, you also need to show a short comic strip for crow autobiography discussed above, as it was asked in question. Why don't you use the design blog instead of giving links here, others would also see right ? I don't know how to do that, sir , I am embarrassed to say that. The above link is my answer to the visual communication question of feed 2013 . Please give me your feedback. My response to the question no. 3 of feed 2013 . 1. The distinction between the cash counter and the waiting table counter should be well labeled. 2. The white board between the mandir and the photo frame does look aesthetically pleasing, and can be seen as disrespect to the god . 3. The colour combination of the cash counter and the waiting table , does not go well together , red and brown is not a good choice. 4. The cold drink refrigerator seems hidden in the corner , it should placed between the two counters . 5. The menu chart shouldn't have a shiny polished surface , the reflection of the light making the item obscure , a matt finish is desirable. Ceed 2013 , part B , question no. 2 . 1 . After welding two pieces of iron together , the mark of the welding doesn't look pleasing, it would look better with it being invisible. 2. The nut bolts used to joint parts does not look good , making them invisible would look better, though that would play difficult for the engineers to repair. 4. Women take time to get ready, most of it is consumed in pinning the saree pallu , so that it doesn't show, an invisible pin will save a lot of time. 5. There is nothing more aggravating for a book lover , than getting his books all twisted and stained return back after borrowing it , lets make them invisible. Please note that the question also look for humor in your answer, so I have taken more consideration of the creativity and the humor in my instances. I wanted to ask that in Part B type ques where we are expected to generate three concepts and give one final solution, is the final soln one of the 3 concepts or a combined concept? Sir, your blog is incredibly helpful. Please keep writing. ok, will try to do. Hai Bhanu Chander sir I have been following your blog for past 4 months all the materials are incredible and sufficient. And wanted to tell u that for writing NID-DAT exam on jan 7 it was very useful for me thank you once again. Can the Final One Consist of both (Though I am covering all the five design considerations in all three of my concepts ? Dear Bhanu Chander Sir I have been following your blog for past 4 months its extremely useful and sufficient, In Fact it helped me a lot in NID DAT 2018 also .